Hedonic adaptation means we end up about as happy as we were before getting there and ​achieving the goal. It’s why lottery winners end up around the same level of happiness as they were before they won the big bucks. Hedonic adaptation explains why the new car isn’t exciting after a while. This is actually a good thing. It means we set new goals and try new experiences. The downside is we don’t stay happy for long when our sources of happiness are external. Most of my life I’ve been a pessimist (or a realist with a negative bent). It’s easy for me to see what can go wrong with a situation or idea. One day I came across the following Tony Robbins’ quote on Facebook (hey, where else do you get your inspirational sayings?). ​I’m not sure if he is the original author, but this was an eye opener for me. What a concept! I printed it out and it hangs on my office wall to this day, right next to Johnny Depp as Captain Jack Sparrow saying “the problem is not the problem. The problem is your attitude about the problem.” Brilliant! So how can love, grace, and gratitude help us have a happier attitude? Positive psychology tells us that social support and relationships are strong predictors of happiness (Diener & Seligman, 2002). Our social relationships do more than improve our ability to be happy. They help us to be healthy (Umberson & Montez, 2010). There is a clear link between the number and quality of social connections and markers for physical and emotional health. So spend time with friends. Your attitude and body will thank you. Grace is our connection to the divine, however you define it. Research demonstrates that having some type of spiritual life contributes to your overall happiness and well-being (Ivtzan, Chan, Gardner & Prashar, 2013). Even if you don’t believe in a higher power, simply practicing meditation on a regular basis strengthens your ability to stay in a happy place (West, 2016, p.259). This is the powerhouse. Study after study show practicing gratitude improves your mood. I don’t think there’s any mistake that attitude is part of gratitude. Let me take you through an example. I’m driving to work, I’m running late, it’s raining and I packed my lunch because I didn’t have enough money to eat out. I hate my job and I’m fighting with my husband. To top it off some jerk cuts me off and I almost crashed. I’m guessing some version of this will be fairly familiar to most of us. What exactly am I supposed to be grateful for in this scenario? I’m grateful my car works and I’m not taking the city bus. I’m grateful I have a job to help me cover my expenses, even if I don’t like it. I’m grateful I have food to eat. I’m grateful that the guy didn’t make me crash and I am safe and sound. I’m grateful my husband and I will sit down and discuss the issue as we have every other issue and manage to come out on the other side. If you want the spiritual experience of happiness, spend time with friends, connect to a higher power, and actively practice gratitude. We may not be able to travel to happiness and stay there, but we can always find our way back. Diener, E., & Seligman, M. (2002). Very happy people. Psychological Science, 13, 81-84. Ivtzan, I., Chan, C.P., Gardner, H.E., & Prashar, K. (2013). Linking religion and spirituality with psychological well-being: examining self-actualisation, meaning in life, and personal growth initiative. Journal of Religious Health, 52, 915-929. Peterson, C. (2006). A Primer in Positive Psychology. New York, NY: Oxford University Press, Inc.
Umberson, D. & Montez, J.K. (2010). Social relationships and health: A flashpoint for health policy. Journal of Health and Social Behavior, 51, S54-S66. West, M. (2016). The psychology of meditation: Research and practice. 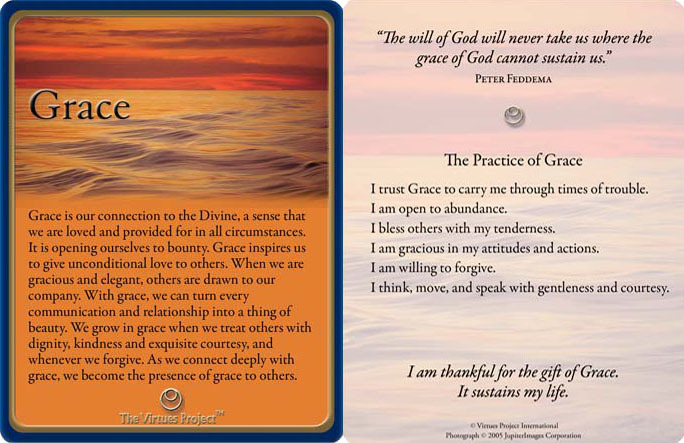 New York, NY: Oxford University Press, Inc.
​I recently attended an online webinar based on the book “A Pace of Grace: The Virtues of a Sustainable Life” by Linda Kavelin-Popov. A sustainable life is about doing more of what I choose to do and less of what drains me. It means taking the time out each day to recharge and keeping self-care at the top of my priority list, not the bottom. Sustainability is about moderation and focusing on your passion. Here are 5 of the strategies I’ve found the most helpful. Even brief meditation has been shown to reduce fatigue, improve working memory and executive function. Too busy to meditate? How about mediating in the shower? Savor the feeling of the water cleansing your body and spirit. You can even meditate while driving – with your eyes open! Focus on breathing in and breathing out. When a thought comes, acknowledge it and return to your breath. This type of mindfulness mediation has been shown to reduce anxiety. According to researcher Emma Seppala, strong social connections improve mental health, boost the immune system and may even help you live longer. Connecting with friends is more than sending a text or “liking” their Facebook status. It means real connection. Got 5 minutes? Call up and say “Hey, I only have a few minutes, but I was thinking of you and just wanted to touch base.” Ask them how they are and really listen. Schedule face time too. Meet for coffee or setup a lunch date (you gotta eat). What gives you joy? What brings meaning to your life? These are just a few of the questions from “Plan a Sustainable Life,” a handout from my POG Webinar. Until I thought about it, I realized I hadn’t done anything “just for fun” for months! So I schedule a board game night with the gals (hey, it’s my idea of fun) and laughed for hours with them! Bonus: This satisfied both Play and Connecting with Friends. (Here is the handout for "Plan a Sustainable Life." For many of those who live in my home state of Florida, this is paradise. Just going outside is being in a sacred space. Not so for me. I don’t dig the tropical climate, the palm trees and sandy beaches. I long for cool weather in the 50’s, beautiful tall trees and forest paths. 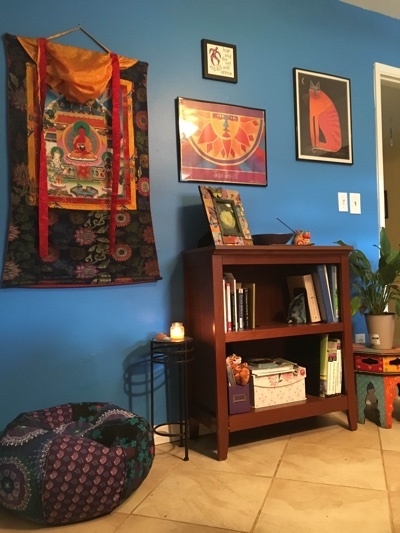 So I created a sacred space in my home office. It’s where I meditate, work, and sometimes daydream. I keep live plants in my office, as even a glimpse of nature is enough to have a positive impact on health and life satisfaction. Whether a place in nature or a corner of your room, find or create a space that soothes and nourishes your spirit. My sacred space in my office. Research shows that watching too much television is associated with obesity in children and adults. Watching too much TV also increases our chances for diabetes, heart disease, and stroke. Besides, if you’re watching TV, you’re probably not interacting with your loved ones. Planning a sustainable life is about having more time for the things that matter. The average American watches 5 hours of television a day! Even if you only cut back by 1/3, you’d have around 11 extra hours a week to do things you enjoy! I’m grateful I was able to take this webinar. In fact, I’m thinking of offering a Pace of Grace webinar myself. 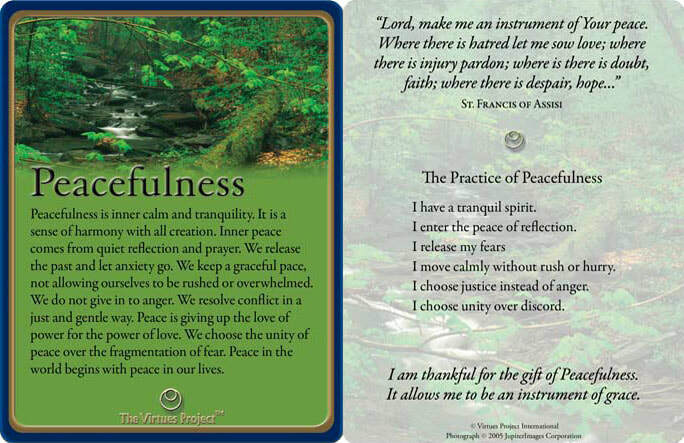 Even adopting a few of the tools has given me more peacefulness and Grace in my life. How do you plan a sustainable life? This is possibly the most difficult topic to write about when emotions are high and the pain is raw. The tragic events of Orlando, the loss of 49 human lives listed here http://www.cityoforlando.net/blog/victims/ , of Philando Castile, Alton Sterling and the 5 police officers in Dallas, and the young singer, Christina Gimmie, is a devastating blow to humanity and the fundamental values of being human: happiness, love and life itself. We support and send love to our fellow brothers and sisters with our deepest condolences for all affected by these tragedies in Orlando. By writing this piece, I seek not to change the world or people – I simply seek a deeper understanding of that which I have no control over and how others react to any given situation. I am writing this piece to dig deeper within myself – to find peace in the wake of this tragedy and acceptance of what is beyond my control. How can anyone make sense of the insensible? In times of conflict, I find there are several virtues that help me to gain strength and insight. The following virtues call to me to create within me and with others unity, peace, tolerance, acceptance, compassion and love. May we no longer be at war with one another. so we can be mindful that we are not separate. That our hope be restored and our communities healed. ​​Assertiveness is speaking one’s truth with peaceful confidence. It is discerning the song we were given to sing and using our talents as a gift to the world. We have the courage to speak up for what we believe is right. We tell the truth about what is just. Assertiveness comes from knowing our own worth, and honoring the dignity of who we are. We stand on our own holy ground and set boundaries without guilt. We never beg or make demands. We ask for what we need by making simple, positive requests. We treat ourselves with respect and expect respect at all times. When I did a Virtues Pick for 2016, I received Determination. 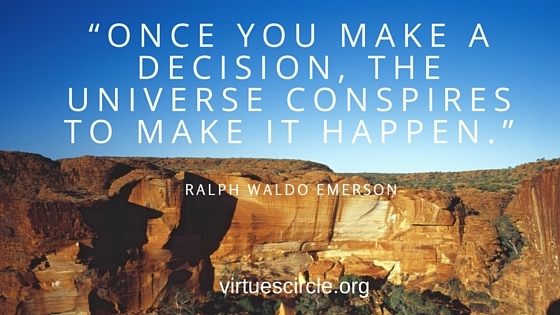 This virtue is all about discerning the path we want to take, the one we feel led to take, then setting goals, and achieving them, step by step. It often begins with a vision. Proverbs 29:18 says, "Where there is no vision, the people perish." In the children's book, Alice in Wonderland, Alice is lost, and asks the Cheshire Cat which path to take. The cat wisely says, "If you don't know where you're going, any road will take you there." The first and perhaps most important step is to decide what you want to do, or where you want to go with your life and energy. Set your intention. What goal is worthy of great effort? It doesn't have to be a big goal, just one that matters to you. It could be a personal goal such as quitting smoking, or turning an unhappy relationship into a happy one, solving a problem in our lives, or overcoming a financial challenge. For me, it begins with prayer and meditation. As Albert Einstein, the great physicist said, "I want to know God's thoughts. The rest are details." Aligning our vision with God's will for us is true spiritual efficiency. After you choose a goal, create a clear picture of it. Use the full power of your mind to imagine the goal being accomplished. Some people make a "vision board" with images that represent what they are aiming for. Devotion: What Calls to Me so Strongly that I cannot Resist? The above stated question comes straight from The Virtues Project™ deck of cards, and it references the Virtue of Devotion. Lately, I’ve been inspired by many different forms of devotion I’ve been blessed to witness, and I’d like to take a look at a few examples. A beautiful woman that I know and respect has an incredible voice—the kind that arouses a deep misty-eyed emotional response. For a long time, though she knew singing was her calling, she faltered because of self-doubt. Her devotion to her craft wavered. ​But in the past year, her growth has been immeasurable. She let go of that which held her back and renewed her devotion to her incredible talent. She walked through fear and pursued her passion. Her calling—singing—called within her in a way that she could not resist. Now, her career is flourishing. She’s been blessed time and again with another venue to share her gift, and I can attest to the fact that the world is a better place because of her gift. Here in the Cook Islands, the new school year has just begun and this is what I wrote to teachers as a spiritual kick start to the new year for a joyful and meaningful school year. Do you remember your favorite teacher? I certainly do. Mine was a short Italian lady who wore long dresses, thick-soled shoes and had a little moustache. And I adored her. At that point, I was a discouraged, probably depressed child who didn't do well in school, believing the shaming names I was called, like "dummy" and "stupid". So I day-dreamed a lot and didn't bother in school, which my poor grades reflected. Mrs. Palmisano looked into my eyes one day early in 8th grade, and said, "I expect excellence from you in my class, Linda. I see how intelligent you are." I was shocked, but a little flame of hope lit within me. Her faith in me literally woke me up to a world of learning. I began paying attention, and it paid off in excellent grades and new confidence, which continued through university and graduate school. The influence of a caring, challenging, enthusiastic teacher is a priceless gift. That's why I deeply admire teachers, especially those who see their work not only as a job, but a calling.